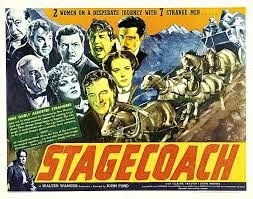 The Film: Stagecoach, considered by many critics to be the first serious Western film. The Stars: John Wayne, Claire Trevor, Thomas Mitchell, John Carradine, Donald Meek, Berton Churchill, Louise Platt, Andy Devine and George Bancroft. Source Material: The short story "The Stage to Lordsburg" by Ernest Haycox. Awards: Two Academy Awards: Thomas Mitchell for Best Supporting Actor and Best Music (Scoring) for Richard Hageman, Frank Harling, John Leipold and Leo Shuken. The Plot: A group of Stagecoach passengers make the perilous journey from Arizona to New Mexico while attempting to outrun a band of Apache warriors. Along the way they pick up an escaped convict, The Ringo Kid (Wayne), bent on avenging his brother's death. 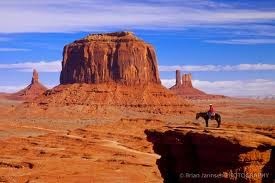 Location: Monument Valley. This is Ford's first use of the region, which is along the Arizona-Utah border. Of course, Ford would use Monument Valley in many more films, including My Darling Clementine (1946) and The Searchers (1956), making the valley the classic landscape of the American West. Best Performance: Thomas Mitchell as drunken Doc Boone. Mitchell won the Oscar for best supporting actor for this performance and it was richly deserved. Mitchell had a great 1939, also appearing in Gone With the Wind, Only Angels Have Wings, The Hunchback of Notre Dame and Mr. Smith Goes to Washington, but this was perhaps the best performance of his long career. There's plenty of humor in Mitchell's portrayal (watching him try to wrestle away a whiskey drummer's bag of "medicine" is hilarious), but Doc Boone is more than just the comic drunk. He is the most astute observer of human nature on the stagecoach and actually quite brave when the circumstances call for it. One of Mitchell's best scenes is below. Best Line: "There are some things a man just can't run away from." The Ringo Kid to the marshal (Bancroft) who wants him to avoid a gunfight with the Plummer gang. The Show-stopper, Part 1: Wayne's star-making entrance as The Ringo Kid. 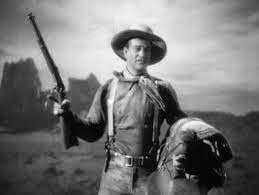 Wayne had been kicking around Hollywood for more than a decade when Ford picked him for Stagecoach. The film would have made Wayne a star in any case, but his show-stopping entrance --twirling his rifle and yelling, Whoa-O," while Ford moves the camera in for a close-up -- cemented Wayne's legacy as an American icon. The Show-stopper Part 2: The climatic chase scene where the stagecoach attempts to outrun Apache warriors. The highlight is legendary stuntman Yakima Canutt's drop from the stagecoach to a team of running horses. Overlooked Element: The beautiful musical score, which is based on American folk tunes. Some of the traditional songs woven throughout the film are "Jeanie With the Light Brown Hair," "Bury Me Not on the Lone Prairie" and Ford's favorite hymn, "Shall We Gather at the River." 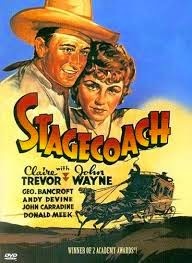 Why it's essential: Stagecoach is quite simply one of the greatest of all American films by one of the greatest of all American directors. 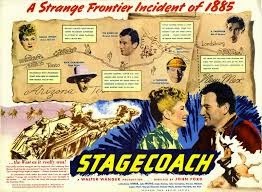 Stagecoach is about as close to perfect as any film ever has been: There's not a wasted moment or piece of dialogue. It's easy to see why Orson Welles watched this film more than 40 times before making Citizen Kane. Availability: Streaming on HuluPlus and DVD. Next week we'll look at Gone With the Wind.